Downtown Belmont is our home in addition to being one of the great small towns in America. We are proud to be a part of this community, and our location on Main Street is in the heart of Belmont NC’s Historic downtown area. It is a setting that is friendly and convenient to many, close to I-85 and Charlotte, and yet an environment that is simply said, warm and very comfortable. Visitors and new residents are welcome here, and once they visit, they are struck by the charm and easy going character of this special community. Downtown Belmont is a beautiful area chock full of small boutiques, shops and local businesses diners can enjoy after a delicious lunch or dinner with us. Located right near Nellie’s in Belmont NC, we’re a short 10 minute drive from Belmont Abbey College and we’re close to several Belmont apartments. Being part of the Downtown Belmont community helps make The String Bean the amazing restaurant we have the pleasure of owning. We invite you to visit Downtown Belmont soon and to come and see us at The String Bean. We are certain that you won’t be disappointed. 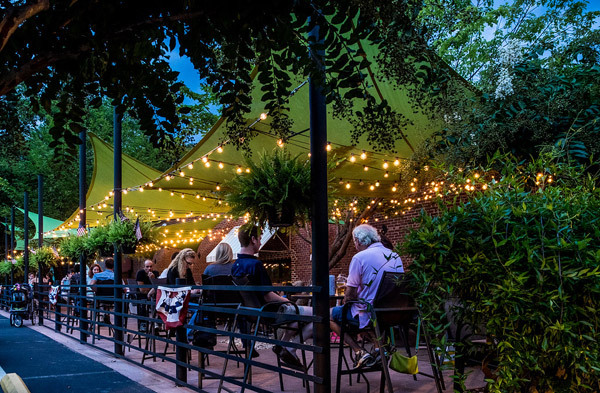 Open year round, our outdoor dining patio in Belmont NC is a favorite spot for many locals.